If you are planning on a big adventure on the trail, make sure your body is up to snuff. 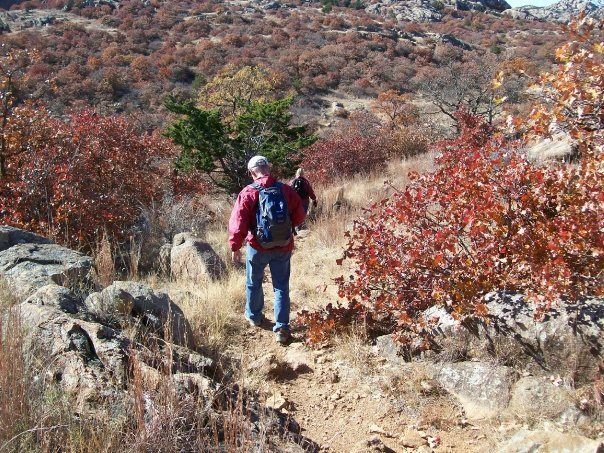 Part of the solution: Hitting the trail often to get yourself in hiking shape. Winter is long gone, and for a lot of people that means big plans for spring and summer hiking and backpacking. The hardiest of us didn’t wince at winter and kept up our trailwork during the colder months. But plenty of us took the winter off. And still more are planning more ambitious treks for the summer. If you’re not already in hiking shape, then the time is now to get going. Tackling long section hikes on the Appalachian Trail, or backpacking in the Rockies won’t be the same as your average weekend day hike in your favorite state or national park. I’ve got some ideas for getting in hiking shape that will help you go big. In the first of two parts, we’ll tackle that with functional training. That is, you’re going to mimic the things you do on a hiking or backpacking adventure with your training. Go on practice hikes. If you’re only getting out a couple of times a month or less, it’s time to up your mileage. If you’re planning a through hike of the Grand Canyon, then getting out to level, easy trails for a few miles a month won’t cut it. Get more ambitious and plan longer, tougher outings. Wear a loaded pack. Break in your boots if they’re new. The best way to get in hiking shape is to hike. The prescription: Be walking often, averaging a couple of miles a day. Have one long outing a week – 8-10 miles, and plan for getting elevation loss and gain. The more the better, and do it with a pack. Load it light at first, but challenge yourself with a heavier pack as your conditioning improves. It works for the military, and it will work for you. In time, a 20-mile hump with a 60-pound pack will get you ready to tackle your big challenge. In your off time, spend as much time walking instead of driving as you can; park your car in the far corner of the office parking lot; make a point to walk to talk with co-workers instead of emailing or calling. Take the stairs rather than the elevator. Add strides to your life. Get on the treadmill. Ah yes, the dreaded treadmill. Or as I call it, The Dreadmill. Much maligned, but a very useful tool if you use it right. The treadmill is efficient in that you can find it at your local gym and at home. You can program inclines to strengthen your legs for uphill work and you can set speeds. Most treadmills also have their own programs to simulate elevation loss and gain and pick up the pace to increase intensity. The prescription: If getting out on the trail multiple times a week is impractical, hit the treadmill 3-4 times a week. Time will be more limited, so make the most of it: jack up the incline, starting modestly (3 percent grade) and walk at a 3 mph pace. Increase the incline and speed as you get stronger. Make your sessions last 30-60 minutes a pop. And be sure to log your workouts in a journal to track your progress. For added difficulty, wear a loaded pack while you log your miles. In time, challenge yourself with a 4.5 mph walking pace. Climb stairs. If you work in a multi-story office building (or have access to one) or live near a stadium, doing stairs pounds the glutes, quads, hams and calves. Walk them or run them, it doesn’t matter. This will not only strengthen your muscles, but will also build heart and lung strength – critical in treks with lots of elevation gain or those in higher altitudes. The prescription: Use this as a cross-training workout, starting out at 20 minutes per session. Increase time and speed gradually by the week. And for added work, or course, wear a loaded pack. Substitute a hike day for stairs 1-2 times a week. Seek out stairmills or stair steppers at your gym and get 20-40 minutes of cardio on those, varying the pace, and as much as possible, don’t use the handrails. Pick up the running habit. You don’t need to be a marathoner here, but running has huge benefits for hikers and backpackers. Do this and peel off unwanted pounds; dramatically increase heart and lung strength (perfect for high elevation adventures) and build up leg and core strength. What’s not to like? The prescription: Run outside 2-3 times a week, starting at 20 minutes. If you have to stop and walk every now and then, go ahead. As you get stronger, increase the time and mileage SLOWLY every 1 to 2 weeks. You can start out on flat runs, but if you can get in some places with hills, tackle those. Trail running is even better. By installing this game plan into your life, you are going to work your legs, core, lungs and heart in ways that will lead to big-time endurance, which means you won’t wear yourself out doing what you love on the trail. Next post: Not all training has to be done out on the track and trail. Find out how to use the weight room to build a rugged and sturdy trekking frame. This entry was posted in fitness, hiking, outdoors, running and tagged appalachian trail, backpacking, exercise, fitness, functional training, health, hiking, outdoors, running, trail running, treadmills. Bookmark the permalink. Good call on the stair climbing! It’s definitely one of the best exercises you can do. Also, I love the theme of this. Unfortunately, the hiking in South Florida is pretty pathetic. My wife and I want to head out to hike Colorado or Utah again soon. CO and UT are awesome! I can understand where you might be limited in terms of varying terrain for hiking. It was the same deal for me when I lived in central Oklahoma (Tulsa has more hills). Thankfully, Florida likes football, which means there are lots of stadiums. So you’ve got that going for you. Perhaps weekend outings to Alabama and Georgia are possible? If not, then you will definitely need to get creative. If you hit the trails in the Rockies, be sure to write about it and share. Obviously, if you’ve read this blog much, you know how dear the Rockies are to my heart. Thanks for reading! I’m a floor installer and am on my knees most of the day when I’m working. To avoid any more stress on my joints I go the low impact route for my exercise. In place of running in your list I like to mountain bike. Find a route with a few hills and you’ll get an excellent cardio and leg workout. Stay safe and keep on hiking. That is an excellent choice, man. Biking, be it mountain biking or road biking, is a great way to get big-time endurance training as well as sprint training. It does a lot of work for your thighs and glutes, and like you said, without the impact of running. Now a confession: I am one of those “bad knee” people. It’s been that way since my mid-20s, so we’re talking a good while for me to be dealing with this. I magnified the problem by continuing to play a lot of basketball (full-court for 45-50 minutes, 3-4 times a week with guys who liked to run) for about 12 years. What I found is that if I shortened my stride and avoided heel striking, the stress on my knees lessened considerably. In fact, since making running a much larger part of my training regimen a few years ago, I have found that my knee pain has actually decreased and my overall leg strength has gone up. I like running because the overall motion and pounding it gives you toughens up your legs and core in ways that are highly beneficial to hikers and backpackers. This is particularly true of trail running. However, I can completely understand that some may need to choose an alternative form of endurance cardio to save some wear and tear on their bodies. It looks like you have found a great way to do just that. Thanks for commenting! This is just the information I’ve been looking for! Thank you for posting! Awesome. Glad I could be of help!